Back at our old townhouse in Fredericksburg, VA, there wasn’t much room for decorating. However, I realized during our first year there that we had exactly four bushes in our front hedge. I remembered seeing pink Christmas lights at various Christmsa stores I’ve visited over the years and even at some of the department stores. Instead of just putting generic colored lights on one’s front hedge, why not decorate in purple and pink, gradually adding lights through the weeks of Advent?? Suddenly, those formerly ubiquitous pink lights that were seemingly tacky *had* a purpose, and, of course, they were nowhere to be found, not even at Christmas stores. I asked, and they said they used to carry them, but not anymore. I found them online, but they were expensive, and the shpiping was more expensive than the lights. For years, I searched and searched. I would substitute red lights ,or red and white lights, for pink. My mother-in-law found a set of pink bulbs at a craft store that was closing, but they weren’t enough for a a string, nad they weren’t compatible with any I had. Then, this year, ironically, at Halloween time, I found them. We went to the pumpkin patch at Harmon’s Christmas Tree Farm in Lexington, SC. They have a Christmas store on site, and the store carried *pink lights*!! Plus, they were having a 30% off sale, so I stocked up. “Mary, did you know that some blasphemous jerk would write a song about you? “Mary did you know that people who claim to follow the Bible literally would completely dismiss Luke 1:28 (how can anyone be “full of grace” who is in sin?) , Luke 1:42 (“blessed are you among women”), Luke 1:43 (“the mother of my Lord,” which, of course, in Hebrew, means God), Luke 1:45 (“blessed are you who believed that what was spoken to you by the Lord would be fulfilled”) and 11:28 (Jesus echoes Elizabeth’s words and says that Mary is blessed because she heard the word of God and observed it), Luke 1:48 (“all generations shall call me blessed”), Luke 2:19 and 51 (“Mary kept all these things, pondering them in her heart”), Luke 2:34 (“and you yourself a sword shall pierce”), John 19:26-27 (Mary is our mother, too, and a beloved disciple takes Mary into his home). So, yes, Mark Lowry, Mary *did* know. Your little seemingly pious lyric is really an insult to the Theotokos, a contradiction of the Holy Bible, and a denial of the truth of the Immaculate Conception. What’s worse, this song gets “performed” at many Catholic parishes, even at Mass, and people are offended when anyone points out that it is heretical. Several years ago, when people asked what to get Allie for Christmas, we suggested some _VeggieTales_ titles. We like the kids getting religious kid show DVDs as presents because a) they’re sometimse more expensive than secular ones, b) (obviously) they help with the kids’ upbringing; c) it keeps them away from the secular garbage and d) DVDs dont’ contribute as much to our clutter problem as toys do. Sadly, Big Idea Productions is in big trouble. Phil Vischer has reported that Big Idea’s current parent company, Entertainment Rights, has downsized Big Idea to *11* staff members. Even Kurt Heinecke, who’s been the composer since the beginning and an integral part of VeggieTales’ success, has been laid off. The total net worth of Entertainment Rights is now *less* than the worth of the original Big Idea when it went bankrupt in 2003 and was bought by Classic Media (which was later bought by ER). Apparently, Tommy Nelson and Focus on the Family aren’t doing well, either. Our local Catholic book store, the St. Francis Catholic Shop, operates on a deficit. We are living in a time when as Phil Vischer as prevoiusly reported, polls say that most teenagers think that “christian” means “homophobe”. We are living in a time when the majority of Catholics supported the most pro-abortion president in history. We are living in a time when the most pro-abortion candidate in history has been elected president of the United States, a man with ideological ties to Marxism, the New Age and Islam. We are living in a time when the world is on the verge of an economic collapse to rival or exceed the Great Depression. We are living in a time when “holiday” shoppers trample store employees to death and shoot each other in the check out lines. 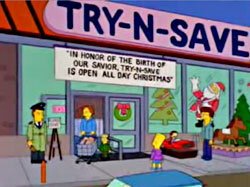 In the spirit of Tossmas, why not eschew the secular retailers altogether? Instead of buying all the usual junk that people don’t really need, why not spend your Christmas shopping money at your local (or online) Catholic or Christian book store? Buy the kids _VeggieTales_ DVDs . Buy SuperBook Vol. II (That’s what our kids got for St. Nicholas Day) or Vol. III (coming to the Hathaway house this Christmas) or its follow-up The Flying House. The Donut Man’s ministry has taken a hit since he converted to Catholicism a few years back and lost his Evangelical fan base. Give some of his DVDs and CDs some support. Subscribe to Netflix and watch many of the great Christian videos they have on their download service: so they’ll get more. Some of the best kids’ series (like _Cherub Wings_) and some of the best Catholic movies of all time (including _The Mission_, _The Song of Bernadette_, _The Fourth Wise Man_ and _The Scarlet and the Black_) are available for download through Netflix. Buy some good Catholic DVDs for the adults in your life, like the many offerings in the Ignatius Catalog and the EWTN catalogue. While you’re at it, consider a book or two. I saw my brother and his kids for the first time in several years a few weeks ago, so I bought them some books at the aforementioned St. Francis Shop. I told them they could gladly exchange them. One of the books was a Navarre New Testament. Turns out his teenaged daughter had just asked him for her own Bible. His younger daughter, who has previously expressed a desire to be a nun, loved the saints book I gave her. A few years ago, I heard this tune on Glenn Beck’s radio show. I tried searching for it, but someone else has a similar parody called “HanuRamaKwanzMas,” which is not quite so biting in its satire. Have a RamaHanuKwanzmas, it’s the PC Time of Year! Every holiday displayed –because of morbid fear. Happy RamaHanuKwanzmas, yeah we know the name is queer. Oh, good golly, can’t offend nobody on [BEEP]mas this year! When we think up one for gays! Happy RamaHanukwanzmas, what a time for winter cheer! But if you see a Christmas Tree, you’ll hear Christmas jeer! Versus Santa and his elves! Have a RamaHanuKwanzmas, and everyone must now adhere.